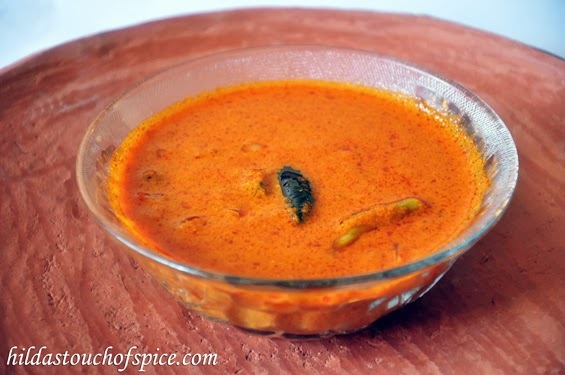 Sorak is a traditional, plain and simple fresh coconut based red curry which is prepared during the monsoon season. Due to the heavy rains and stormy weather, it is impossible to fish and so the fishing activity comes to a standstill. Fish is rarely available in the markets and this is the time to bring out the dry fish and enjoy a simple meal of this deliciously red and tangy Sorak (curry) with rice and dry fish preparations. Sometimes you can add your favorite combination of vegetables to add nutritive value but usually it is just a plain preparation which is a part of the daily meal. Grind together the above mentioned ingredients with enough water, to form a fine smooth paste. Transfer to a bowl. Rinse the blender jar with some water and reserve for the curry. Heat up a clay pot or regular cooking pot with oil and sauté the onions till soft and translucent. Add the slit green chilli and the prepared masala paste and sauté for about 2-3 mins. Add the reserved water, enough water depending on the thickness you desire and give it a good stir. Let the curry come to a boil and then simmer with the lid closed for about 5 mins. Add the tamarind pulp or kokum or raw mango slices. Cook for another 2-3 mins. If using raw mango then cook till the mango is cooked through. Serve hot with steamed rice or Goa boiled rice accompanied with your favorite side dish, pickles and especially dry fish preparations. If using raw mango, you can boil the slices till cooked and then add to the curry. You can add vegetables if you prefer. Sourness is as per personal taste. You may adjust accordingly. You may add a combination of tamarind and Bindi Sola or just fresh or dry raw mango slices. Love the simplicity and clarity of the recipes. They prompt one to try them out. Will create the bread pudding this weekend.